Thousands of gas wells, pipelines, storage tanks, compressors, and other pieces of infrastructure in oil and gas patches, which individually don't emit the huge volumes of air pollution coming from a single cement kiln or a coal plant can, when combined, easily total tonnage larger than both. And that's what has happened in DFW over the last decade. As the Barnett Shale boom crept further into the region's "non-attainment" area" for smog, all the air pollution from all those thousands of individual sources begin adding up and having an impact on air quality. While other large sources were actually decreasing their pollution, the oil and gas sector was going the opposite direction. It ballooned. To the point where it's now the fourth largest category of air pollution in that "non-attainment area." The three sources that outrank it? 1. All vehicles on the road. 2. All vehicles off-the-road, and, 3. "area sources" a catch-all term including everything from backyard BBQs to small paint shops, and probably some oil and gas sources itself. 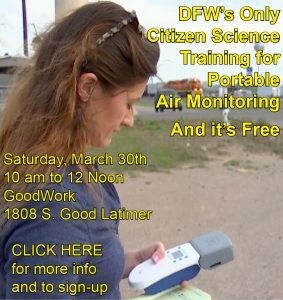 Oil and Gas air pollution is, by volume, now the largest source of industrial air pollution in the North Texas area, exceeding the Midlothian cement kilns, local power plants (now all gas-fired), and large manufacturing plants like the GM truck and SUV factory in Arlington. Only the East Texas coal plants emit more and their 90-100 miles outside the nonattainment boundary (another problem that needs fixing). At the same time oil and gas air pollution rose from Barnett Shale development, DFW smog levels, which had been declining, began to plateau. 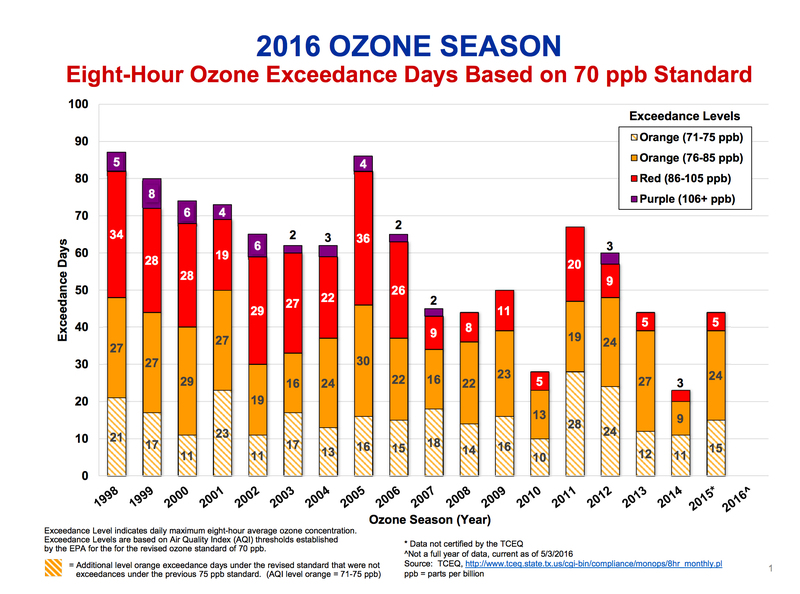 For a decade now the annual smog average has hovered on either side of 85 parts per billion (ppb) – the obsolete 1997 standard that we were supposed to reach in the early Oughts. We were at 86 ppb of smog in 2008 and we're now at 83 ppb. Look at the chart below, generated by the North Texas Council of Governments. In 2007 DFW had 45 "exceedence days". In 2015, DFW had 44 "exceedence days." There's a very good case to be made that oil and gas air pollution has prevented DFW from making the kind of air quality progress it might have otherwise made without that burden. For the last five years, the State of Texas has been on a mission to deny any link at all between the oil and gas industry in the Barnett Shale and DFW smog. It's gone out of its way to hide the real volumes of pollution emitted by these sources, as well as avoiding or downplaying the significance to regional air quality of decreases in that pollution. That's not hyperbole, it's the record. 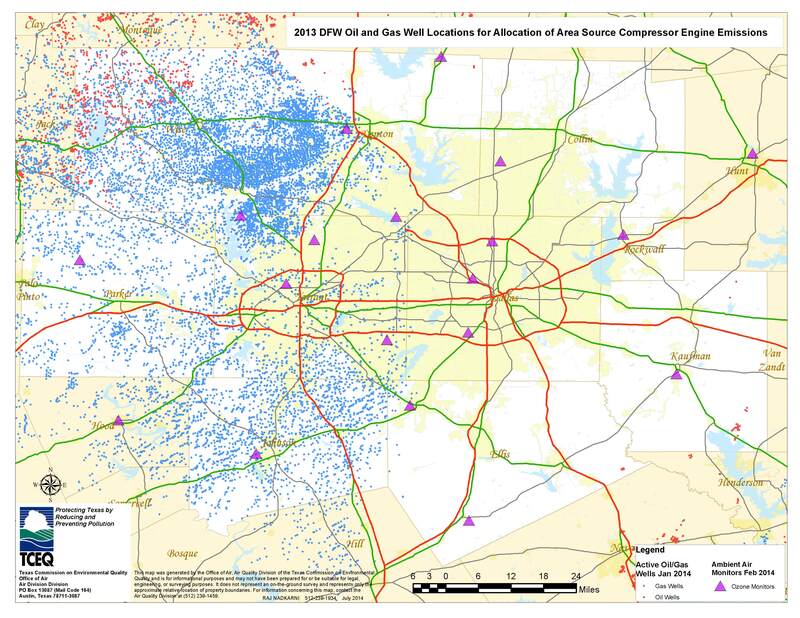 In looking ahead with its proposed DFW air plan now in the pipeline, the State has predicted that a drop in the number of new wells in the Shale will equal a drop in the amount of air pollution coming from O&G sources. Sounds logical doesn't it? Yet the industry's own text books say that it ain't necessarily so. A drop in new wells is the tip of the O&G iceberg in DFW. Just because there were no new wells drilled last month doesn't mean there's no new pollution being released this month. Some 20,000 wells, almost 1000 large compressors, untold thousands of smaller compressors, millions of gallons of storage capacity, miles of pipelines – these all continue to operate and emit huge amounts of air pollution 24/7. And when production-per-well drops, and the densest parts of the patch begin to play out, as is occurring now in the Barnett, investors don't usually go with the flow. They want to increase the flow. And so they install more "lift compressors" to squeeze every last molecule of gas they can out of a well. These compressors, powered by gas or diesel, increase air pollution. Not by a lot by themselves, but when you start putting them together, by the thousands, then yeah, they have an impact. And so, even when O&G production is declining, you can have increases in O&G air pollution. Downwinders at Risk and the Sierra Club made this argument in our comments about the state's plan, providing sources from industry to show exactly how this has taken place plenty of times before. We told Austin it was underestimating the impact of O&G air pollution – again. The State dismissed our concerns and said no problem. Which brings us to Mansfield in Tarrant County, scene of the last pre-HB40 gas ordinance fight in the state. Last week, there was a small headline in the Fort Worth Star-Telegram a lot of people probably ignored. It concerned a routine variance to zoning code being requested by (notorious) gas well operator EagleRidge. At issue was whether the company could keep using gas powered lift compressors instead of electric-powered ones as the city's year-old ordinance required. EagleRidge made an argument in favor of the variance which sounded very familiar to some of us…. EagleRidge first noticed a dramatic decline in natural gas production at 15 of its wells last year, as it went from 8 million to 2.5 million cubic feet of natural gas per day. Low natural gas prices, trading about $2.10 per British thermal unit Monday, could make the wells economically unfeasible, according to Mark Grawe, executive vice president of EagleRidge. That prompted EagleRidge to try a new strategy, using small gas lift compressors that increase production on the wells. Last year, Mansfield granted a six-month variance to allow the compressors on a trial basis. Grawe said the compressors have already improved production on three of the wells, but addition tests are needed on EagleRidge’s other wells. Eagle Ridge got its variance. And besides the three lift compressors it's operating on the site now, at least two to three more or expected, and all of those might one day be replaced by two giant-sized compressors. And, Eagle Ridge told the council, it's experience in Mansfield will be repeated at "hundreds of wells in Southeast Tarrant County" that have also seen declining production. Eagle Ridge's ratio was approximately one lift compressor for every two wells. There are 15 wells as part of this one variance, "hundreds" in SE. Tarrant County waiting their turn, and 20,000 more throughout the part of the Barnett Shale in the DFW non-attainment area for smog. 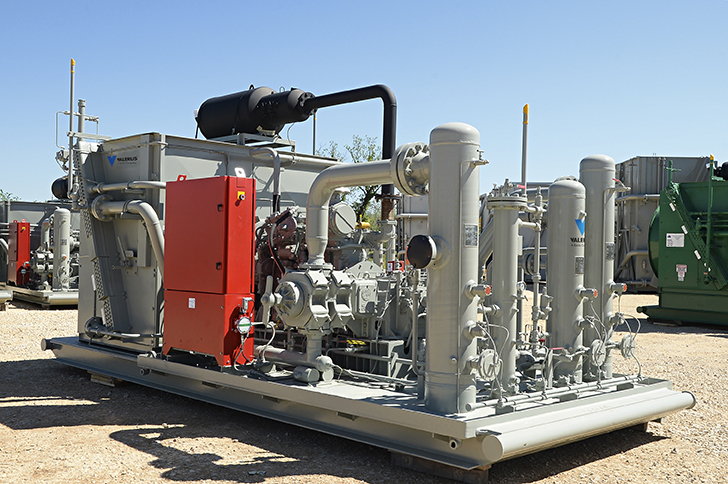 That's thousands and thousands more lift compressors emitting lots more air pollution even as Barnett Shale production is declining – and most will be located in cities or counties where there's not even a requirement for electric power to get a variance from. In other words, this is exactly the scenario Downwinders and the Sierra Club warned about in their comments, but which the state dismissed. If you think there might be a correlation between O&G pollution and stagnating DFW smog levels, what's the answer? It's pretty straight-forward. Stricter emission standards for all equipment, leak detection, electrification of large and small compressors. These are all things the industry is either doing in fits and starts in North Texas and elsewhere, or being required by the new EPA methane rules, but they're not being applied across the board in the Barnett Shale, or they don't apply to existing facilities, or both. Who's going to make that happen? 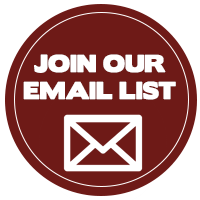 Local governments were doing some of it – up until the passage of HB40. For example, Dallas, Mansfield, and other cities required electric-powered compressors and state-of-the-art leak detection. But that's off the table, as is any action from Austin. That leaves the EPA as the one regulatory entity that could, if it wanted, impose uniform emission standards on all O&G facilities in the 10-county non-attainment area, including Denton, Johnson, Parker, Tarrant, and Wise counties. It could do so as part of it's own anti-smog plan for the region. But before it can start writing its own plan, the EPA must first reject the state's. And for it to do that we must give the EPA the political support it needs to stand up to the backlash from Austin you know will come. Thus the need for resolutions from DFW cities and counties asking the EPA to reject the State plan. Thus the need to show-up this coming Monday morning at City Hall and support an effort by Dallas City Councilwoman Sandy Greyson to have the City of Dallas join Dallas County in calling for EPA intervention in DFW air quality: 9am Room 6ES, Quality of Life Committee. Don't let the Mansfield variance become the regional template.